Start: 6:30 - 8:00 A.M. The 2013 Holland Cycles Palm Desert Century (PDC) rolled as scheduled on Sat, Nov 9th, '13. Fantastic weather, with sunny skies, mild temps, and light winds, helped make the 3rd Annual PDC even more memorable. This "Round up" email showcases some event highlights. THANK YOU for participating! Congratulations to all riders, regardless of distance, or time, ridden. The desert can be a harsh & unforgiving place--especially for new desert riders! Shadow Tour is proud of every rider for keeping it together, staying safe, riding your plan, following the Rider Instructions, and achieving your personal goals. Many Thanks to Title Sponsor, Holland Cycles, for their tremendous support of the ride. Bill Holland takes great personal pride in crafting each of his bicycles. Learn more by visiting their website, or calling Bill at 619-469-1772. 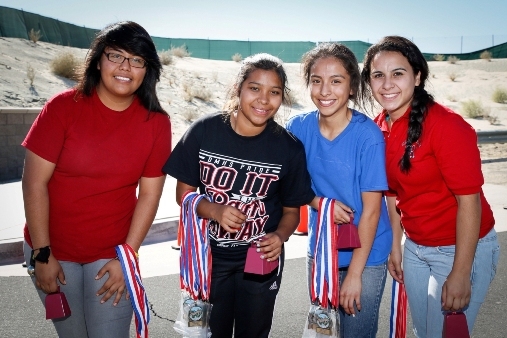 And a very special Thank You to the Desert Mirage High School ASB Volunteers (DMHS). They provided the entire Volunteer base, from Start to Finish! We thank them for their enthusiastic contributions. Especially noteworthy were organizational and on-site efforts of the DMHS faculty supervisor, Kristie Sauceda. This is the primary DMHS ASB fund-raising drive, which benefits numerous school programs & scholarships. Your generous Donations to their fund-raising efforts are very much appreciated. Many of you have expressed concern about PDC rider Charles Hubay, Jr, 65, from Pasadena, CA, who was receiving medical attention early in the ride. While we don't have all the facts, and wish to respect the Family's privacy, I can confirm that while riding with his friends, he apparently suffered a sudden, massive cardiac incident. His friends, and two Nurses riding in the field, responded immediately with CPR. Additional EMT's arrived rapidly and Charles was transported to the hospital within 30 minutes. I must sadly report he did not survive. I have reached out to the family. At this time, they simply suggest donations be made directly to the American Heart Association. Losing one of our Brother Cyclists is the hardest part of the sport we love. We send our Deepest Sympathy, Thoughts, and Prayers to the Family. Future details will be posted on the PDC website in accordance with the Family's wishes. 2. Full Century Finishers: If you registered for the FULL CENTURY, or FULL CENTURY W/TT, and you completed the 100, or 130 mile course, but your name is missing from the list, please send Jim an email with "100" (Full Century) or "130" (Super Century) and your Name & Bib # in the Subject Line. The Full Century Finishers List will be updated through Fri, Nov 16, '13, then locked in. Note: SHORT COURSE riders are not eligible. 3. Preliminary Time Trial Results: CEP Timing did another fabulous job capturing accurate for results for TT Riders. Congrat's to all who opted-in for the 14.65 mile TT up Box Canyon. 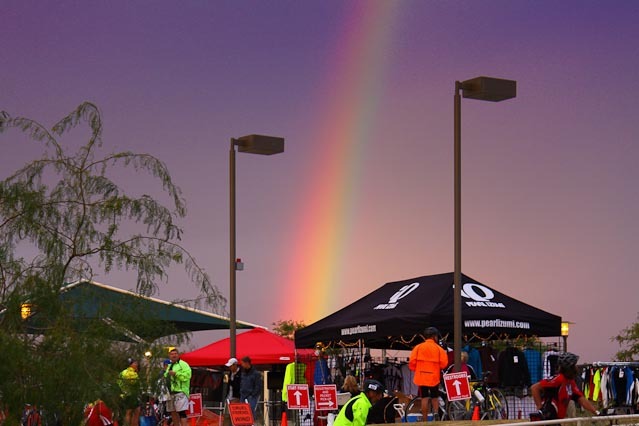 Preliminary Results are posted on the CEP Timing website and show Men's Champion David Bruemmer from Carlsbad, CA, and Women's Champion Sally Majidian from Palm Desert ripped up the TT course! In the Men's Field, 2011 Champ David Bruemmer, posted an dominating 41:46 solo effort, followed by a close duel between James Ragan, San Bernardino, CA (45:05), and Steve Wood, Crestline, CA (45:06), CA. In the Women's field, Sally Majidian improved upon her 2012 PDC winning time by posting a remarkable 50:22, holding off hard-charging 2nd Place Jill Theodossi, Carlsbad, CA (51:42) and Tamara Goeppel, Whitehorse, Yukon Territory, Canada (51:43). To resolve any timing issues, email CEP Timing prior to Noon on Fri, Nov 15, '13. After Nov 15, results are FINAL. Custom PDC Acrylic Trophies will be mailed to the Top 5 Men & Women TT finishers after the results are finalized. 4. Last Chance Jerseys: In response to rider requests, we're reopening a short window to order PDC Jerseys. The deadline for ordering Jerseys in the 2nd Production Run is 3:00 P.M. (PST) this Fri, Nov 15, '13. To place an order please see the directions below. Jerseys take 6-8 weeks to produce; and will be mailed in Jan (free shipping). Ship date will be posted on the website. Price is $75/Jersey. a. Order: Deadline is 3:00 P.M. Fri, Nov 15, '13. b. Download & complete the CC Authorization Form. 5. Last Chance "Tec" T-shirts: Many riders were amazed by the soft-as-butter "Tec" Hanes Cool Dri T-shirts! These T's can easily be worn as a base layer year-round. Only a few remain in stock, see below, or visit the Store, 1st Come, 1st Served. Pric is $22/T-shirt and there is no 2nd Production Run for T-shirts. 6. Last Chance "DMHS" Donations: You may not know it, but the Desest Mirage H.S. Vol's gave up a big part of their Homecoming weekend on Fri & Sat preparing & supporting your cycling adventure. Some kids even missed part of their Homecoming Dance to cheer in riders in Palm Desert. Here's our chance to return the favor! If you were satisfied with the Vol's efforts all along the route, please Donate to support their school programs. So far, only 11 of 650 have made online Donations, raising $267. Please click through & Donate today. A generous tax-deductable donation directly rewards the finest Volunteer group in Shadow Tour history! These very cool Vol's provided enthusiastic support all day out on the course. All Donation proceeds go to directly to the DMHS school programs (none to Shadow Tour). Go ahead, make yourself feel good, click on the Donation link and give what you can right now. The event goal of $5,000 has not yet been reached (total donations are currently about $2,000). Think back to your ride and how nice it was to roll into a Rest Stop and have everything you needed ready. Remember the rousing "Welcome" from Vol's at the Finish Line bringing you home with Cheers, Cowbells, and Medals! We all routinely tip restaurant servers, even when the service was average. For most riders, a 15% tip would be about $10. Here's your last chance to show your gratitude to the Vol's who provided OUTSTANDING service with Genuine Care & Smiles. Please click here to Donate. Please do what you can to help. Building Goodwill in Coachella Valley benefits all of us! 7. SCS Photoworks Photos: Scott Stolarz and his crew are busy matching thousands of rider photos and Bib #'s. Here's the link to the SCS Photoworks link. Rider photos will be posted soon. An email will notify riders when the photos are ready. You can search for your photo by Bib # or name. There's also a Missing Bib # section. The wind gusts caused some helmet numbers to come off. Be sure to browse threw the Missing Bib # section to locate additional images. 8. Flash Gallery: Here's a link to the 2013 Palm Desert Century Gallery. All photos are courtesy of Scott Christian Stolarz Photoworks and Photographers Milan Kovacevic, and Dave Overenz. All photos are Copyright protected. 9. Mark your Calendar! The 10th Annual Stagecoach Century stampede will bust loose on Sat, Jan 18, '14. The "Value"deadline is Nov 30th, see coupon below to save! 10. Feedback: We always welcome your constructive comments. Please email your comments & suggestions to Shadow Tour by visiting the contact page. We're particularly interested in hearing what worked well for you out on the course and what can be improved. We also encourage input to update the Rider Levels section to improve advice for next year's riders. Pearl Izumi: Pearl Izumi was a proud exhibitor for the 2013 Palm Desert Century. Get ready for blowout deals on Black Friday at most Pearl Izumi outlet stores. Cya there! Vitalyte: Vitalyte is pleased to continue Sponsorship of all Shadow Tour events. Citris and Grape Vitalyte was at every Rest Stop to keep you hydrated & feeling great! Host Hotel: Homewood Suites by Hilton Palm Desert. Homewood Suites Sold Out for this year's ride. As always, they were wonderful hosts. We look forward to their return as Host Hotel in 2014. SCS Photoworks: Official PDC Photographer. Scott Stolarz and his crew specialize in capturing action rider photos all along the course. Rider photos coming soon--as early as Wed morning! Thanks for another Palm Desert Century "Dream Ride" in the Coachella Valley Deserts! We look forward to seeing everyone again at the big 10th Annual Stagecoach Century on Jan 18, '14. Until then, enjoy your Fall season of cycling, keep to the right of the white line, always ride alert, and expect the unexpected!